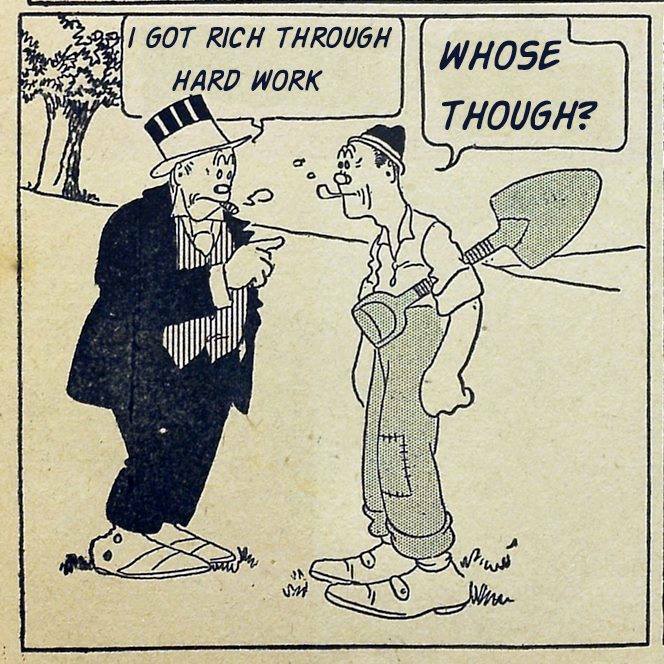 Panel of Maggie and Jiggs comic strip, undated. By principles, Veblen means the overarching habits of mind that enable one to participate effectively in a society or a subset of society. Before the machine age, the age of the industrial process, people thought about themselves and the world around them in terms of “…the principles of (primitive) blood relationship, clan solidarity, paternal descent, Levitical cleanness, divine guidance, allegiance, nationality”. Veblen thinks these principles are in decline as of 1904, replaced by habits of mind of thinking in terms of cause and effect, a scientific habit of mind, because that is what a machine culture needs. These habits relate to the pecuniary nature of the machine age. And the basis for the pecuniary culture is the ownership of property, which is the only one of the primitive standards to survive into the machine age. It not only survives, it becomes the dominant principle of the machine age. Every transaction, it seems, is settled with a payment of money. It became a principle of the natural order of things that free labor is the original source of wealth and the basis of ownership. In point of historical fact, no doubt, such was not the pedigree of modern industry or modern ownership; but the serene, undoubting assumption of Locke and his generation only stands out the more strongly and unequivocally for this its discrepancy with fact. He thinks that Locke’s general idea came from a time when most useful work was done by small artisans like cobblers and blacksmiths, and farmers. He traces it on to the needs of merchants, and into his time. Veblen saw that while that this idea might work in earlier times, it’s application was not suited to the machine age. Still it was the dominant theory. Veblen describes two other business principles. The first is the stability of money values, which at the time stood on the stability of the price of gold and to a much lesser extent, of silver. It was an assumption of businessmen, but not of economists, says Veblen. The second is a regular rate of profit. This enabled businessmen to capitalize their plant and equipment and their industrial processes, so that value turned on the capitalization rather than output, livelihood of the owner, or serviceability of products. Veblen’s discussion of Locke is strikingly contemporary. Locke’s theory of ownership by reason of work done certainly doesn’t seem like a useful principle to me. Suppose a person sets up a factory, buys raw materials and machines, and hires some people to work for him. Who exactly is mixing labor with goods so as to “own” the resulting product? Or, consider a scientist working in a lab on identifying anti-virals for the Zika virus. The project will require the current work of thousands of people, and past work of uncounted numbers. Who exactly do we identify as the owner of the finished protocols and the final results? Whatever it is, it has little to do with the work done by those uncounted people. Ownership is divorced completely from substantially all of the workers who created the new solutions. We propose a simple hypothesis: Political liberals construct their moral systems primarily upon two psychological foundations—Harm/care and Fairness/reciprocity—whereas political conservatives construct moral systems more evenly upon five psychological foundations—the same ones as liberals, plus Ingroup/loyalty, Authority/respect, and Purity/sanctity. In the US the rise of the anti-Enlightenment right wing and its sponsors forces us to question whether the scientific mind continues to be a form of self-governance and of shared cultural values. And, of course, Natural Law lives on in the jurisprudence of Clarence Thomas, at least according to an astonishing article in the Regent University Law Review which I couldn’t make myself read because the sections I did read were appalling, google it if you have to know. Locke’s ideas generally are associated with the Founding Fathers. No doubt his positions on slavery and expropriating the lands of Native Americans, and his idea that ownership of private property free of governmental interference is a crucial element of freedom, were congenial to their personal desires and philosophical positions. We may need to think about property more closely, as we have done with the other two. It was Locke’s astonishing leap in casuistry, that ‘mixing our labour’ also meant applying the labour of kidnapped slaves, indentured servants or dispossessed proletarianised landholders, that secured his place as the founding father of liberalism. It should be noted that Locke, Lord Shaftesbury chaplain, a founding investor of the Bank of England and the man who drafted South Carolina’s first constitution, is a forerunner of those who developed the stadial theory whereby mankind evolves from lower stages of economic organisation into higher, more civilised stages- eventually achieving industrialism. This dangerous dogma has been adopted by almost all the political schools that have arisen since his day. I think that it was Louis XIV who said, in French of course, Locke that is the man, long before Bismark had run into Disraeli. Regent University Law School. There’s an oxymoron to compete with military intelligence and airline food. The right to property as an expression of “freedom” seems to relate to freedom from usurpation of those rights by the king. That’s opportunistic, especially of 17th century weakness in monarchical rule. But the history of aristocratic contests over resources, with each other and with the monarch, is long. Native Americans, for example, were infantilized and made less than human – a process with biblical origins – in order to negate their rights. The process was made easier in that in the 200 years after Columbus, a majority of Native Americans were killed by European disease and enslavement, hence the land seemed denuded of previous owners. Another argument that enhanced taking, used previously with English enclosures, was to claim that only those capable of “efficiently” using land had valid or superior rights over it. Peasant subsistence farmers, for example, failed the test when “efficiency” was defined as generating the most extractive wealth in the shortest time. For peasants, as with Native Americans and western settlers (say, those at the forks of the Ohio), however, the land and its uses was a way of life, of community, not simply a place from which portable wealth could be extracted. We live with that same argument today, as private capital relentlessly seeks to privatize the commons, public water systems, universities, even ground water (is it ours or Nestle’s? ), for its exclusive benefit. I was going to say that it is the same argument, really. But you seem to agree. So I won’t bother. The links to zionism are obvious. The issue of property rights has to be dealth with in some way, assuming one doesn’t hold to some Utopian fantasy of what is yours is mine and what is mine is yours (noting that property covers a wide variety of different things). There’s a good discussion of property rights in Chapter 9 on Fleischacker’s On Adam Smith’s “Wealth of Nations”: A Philosophical Companion. He discusses and compares the different ways Locke, Hutchinson, Hume and Smith address the issue. Smith comes down in a very different place than Locke, which is maybe no surprise given Smith’s concern with matters of justice and equity. Good article, cited below, by Bill Black on the artificiality, indeed the impossibility, of “free markets”, dependent as they are on the state for their creation and enforcement. That includes writing laws that determine priority of interests and leverage among the players. Collis Huntingdon, one of the California Big Four, knew what he was doing in moving from Sacramento to DC so that he could cajole and bribe legislators full time to protect his RR’s interests. He was not alone, Albany was infamous for its corruption, but he was one of the best, along with, allegedly, JP Morgan and his lawyers. I especially like the discussion on how pharmaceutical executives are “insufficiently rapacious”, and need the help of Wall Streeters to extract adequate profits from their wares.